There has been a long history of violence, prejudice, and discrimination between Catholics and Protestants in Northern Ireland, particularly highlighted throughout the 1960s, when Catholics were discriminated against by the Protestant Stormont Government in both employment and housing. Hence, in order to understand in what ways and how much it occurred, both these areas must be investigated. Firstly, one must look at how the Catholics were discriminated against in terms of employment, and to what extent this occurred. In the public sector, Catholics suffered great difficulties being employed, as there appears to have been some bias towards employing Protestants, especially in senior levels of the civil service. For example, in a report by the Cameron Commission in 1969, it is stated, "[As of October 1968] In County Fermanagh, no senior council posts, (and relatively few others) were held by Catholics" and according to the Sunday Times, in the same county, in 1961 "322 of the  posts, including the top ones, were filled with Protestants. 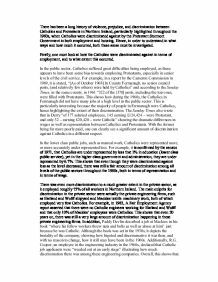 This shows how during the 1960s, the Catholics in Fermanagh did not have many jobs at a high level in the public sector. ...read more. This shows that even 20 years on, there was still a very large amount of discrimination happening in these private engineering firms. In addition, Paddy Devlin described a job at Mackies in his book "where his fellow workers threw nuts and bolts as well as abuse at him" just because he was Catholic. Although the book was set in the 1930s, it depicts the brutality of the company, showing how bigoted and discriminative it was then, and with no reason to change, how it still may have been in the 1960s. Additionally, R.G. Cooper, an employee in the engineering industry in the 1960s, declared that Catholic job applicants were "weeded out at an early stage" illustrating how much discrimination there was among these engineering companies. Overall, this shows that there was a large amount of discrimination by unionists towards Catholics in the private sector (on its own and in comparison to the public sector) in terms of hiring and retaining workers. This hence illustrates that they wanted Catholics to have a lesser opportunity in the working world. ...read more. As well as being limited by the government, Catholics were also forced to move from Protestant areas by the people who lived there, sometimes violently. For example, B MacLaverty wrote in his novel "His father and he were the only Catholic family left in the whole estate. Fear had driven others out but his father would not move" This shows the extent of the discrimination; even local Protestants would try to remove a Catholic from a unionist district, illustrating how much bigotry and discrimination there was for the Catholics. Overall, this depicts how Protestants were given priority to houses and how Catholics were given no freedom to live where they wanted, both showing a significant amount of bigotry and discrimination. In the end, it is very clear that Catholics were discriminated against in a variety of different ways - in public employment, although even more so in the private sector by engineering firms. Protestants were also preferred to Catholics in terms of housing priority; however, the main discrimination in housing came from the lack of freedom in living within gerrymandered unionist districts. Overall, it is evident that that discrimination occurred to a large extent against Catholics. ...read more. This student written piece of work is one of many that can be found in our GCSE Northern Ireland 1965-85 section. This is an excellent response that is clearly written and uses evidence to offer precise support to the analysis. At times, there is an over reliance on specific examples and statistics were needed too but these may not have been widely available. 5 out of 5 stars. 'Across the Barricades' is a novel written by Joan Lingard. "It's a dead end job anyway...the scrap business. I won't stay in it". Sadie used to work at a hat store until she got fired. She then worked for Mr Blake doing housework. Her family were against the idea of her going out with a Catholic. to do this Northern Ireland would need to become part of it. This now occurred an issue in independence between the two sides. Whilst on the other side, there was England, which; now under the control of Queen Elizabeth I didn't want Northern Ireland to be its own country. Why was Ireland Partitioned in 1921? Causes of conflict in Northern Ireland. and so therefore they attacked and took over post office in Dublin. In the end the catholic Irish nationalists were captured and shot without trial and they were martyrs to the Republican/ Nationalists cause. Because those men were not given a fair trial it angered the Irish Catholics and so this is an important cause of conflict. As it was, the North and South were split. In 1985, the Anglo-Irish agreement upset many Unionists because they saw it as a betrayal. They thought it was a way for the South to exercise some control over the North and that the British had gone behind their backs. By 1691, the English army had defeated the Irish army. Protestants were now in control of Ireland, and ruled the country from their own Parliament in Dublin, but usually under the direction of the Parliament in London, until the English controlled most of the country. How Did the Catholics Grow To hate the Protestants? Coming from a minority myself means that I sympathise with Cal to a greater extent and, knowing what it is like to be excluded and to feel isolated, I saw Cal's joining of the IRA as an understandable, even justifiable action - not as an act of malice or prejudice, but as an act of desperation and hope.